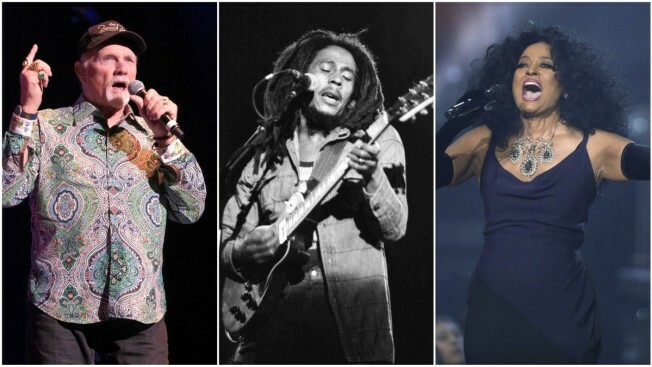 The Beach Boys, Bob Marley and Diana Ross are just a few of the iconic performers who have never won a Grammy Award. Remember when the cast of the TV series "Glee" earned a Grammy nomination for their version of Journey's "Don't Stop Believin'" at the 2011 Grammys, pitting them against Sade, Maroon 5 and Paramore? It's fair that you don't recall that moment — but guess who never earned a nomination for "Don't Stop Believin'''? Journey. The Rock and Roll Hall of Famers have never even earned a Grammy Award, and have only been nominated once in their entire career. They're one of many respected acts in music to have somehow been bypassed by the Grammys, despite much younger acts like Kanye West and Beyonce winning more than 20 awards each. "I'm very grateful that the fans are (still) there regardless of what I have sitting on my shelf," Journey's Neal Schon said in an interview with The Associated Press. "If it happens, it's a nice gesture and something to look it at in memory of everything you've done and accomplished, but you know what? I've got it in my heart." The Rolling Stones, surprisingly, have only been awarded two Grammys, and Led Zeppelin finally picked it up its first Grammy in 2014. Lou Reed only has one win, for best long form music video, though his former band, The Velvet Underground, has never been rewarded for its music. Below we take a look at icons who currently, and sadly, can't put these two words before their names: Grammy winner. — Diana Ross* 12 nominations: Stop in the name of love! How could this be? Maybe this counts for something: Ross did receive the Lifetime Achievement Award, a noncompetitive honor, from the Recording Academy in 2012. — Snoop Dogg, 16 nominations: Give this dog a bone! — Bob Marley* 0 nominations: The first reggae Grammy was presented in 1985, four years after Marley died. Despite that, we all know he should have won or earned nominations for album, song and record of the year while he was alive. At least his children are decorated with Grammys: Ziggy and Stephen have eight wins each, while Damian, Cedella and Sharon have three each. — Chuck Berry* 0 nominations: Beethoven just rolled over in his grave. — The Beach Boys* 4 nominations: "Good Vibrations" brought bad vibrations when it lost in three categories at the 1967 Grammys. — Patsy Cline* 0 nominations: Cline died in 1963, just four years after the Grammys handed out its first award. — Jimi Hendrix* 1 nomination: What stings more is that his sole nomination was for his instrumental performance of "The Star-Spangled Banner" and not an original song. — Queen, 4 nominations: Bog Seger and Chicago are to blame for beating out "Bohemian Rhapsody" and "Another One Bites the Dust" at the Grammys. — Notorious B.I.G, 4 nominations: It's sort of heartbreaking that Biggie lost two Grammys at the 1998 show, which occurred almost a year after his death, to his close friend Puff Daddy. But what's worse? Digesting the fact that B.I.G's epic song, "Hypnotize," lost best rap solo performance to Will Smith's "Men in Black." — Tupac Shakur, 6 nominations: At least Tupac lost to the Fugees, Bone Thugs-N-Harmony and Eminem's debut single, "My Name Is." — Depeche Mode, 5 nominations: Justin Timberlake and Janet Jackson out-danced Depeche Mode in the 2000s when the group was up for best dance recording in separate years. — Patti Smith, 4 nominations: Sheryl Crow and Fiona Apple rocked harder than Smith, according to the Grammys, when Smith was nominated for best female rock vocal performance in two different years. Smith also lost to Carol Burnett and Jimmy Carter in the best spoken world album category. — Janis Joplin* 2 nominations: At least Joplin lost at the 1972 show to Carole King's "Tapestry" and Aretha Franklin's "Bridge Over Troubled Water." — Nas, 13 nominations: Is there another rapper as artistic and lyrically deep as Nas? He's almost the kind of artist the Grammys were created for, but, somehow, he's always walked away empty handed. — Run-D.M.C. * 1 nomination: Back at the 1987 show rap Grammys didn't exist, so Run D.M.C. competed for best R&B performance by a duo or group with vocal with their "Raising Hell" album. But they had to kiss the possibility of winning goodbye: Prince and the Revolution was also a nominee for their funky classic hit, "Kiss." — A Tribe Called Quest, 4 nominations: This is somewhat of a consolation prize: Q-Tip won best dance recording with The Chemical Brothers for "Galvanize." — Kenny Chesney, 6 nominations: Five out of Chesney's six Grammy nominations were for his collaborations, so this year's nomination for best country album marks a new high for the veteran singer. Maybe being solo will seal the deal. — Other well-known acts to also lack in Grammy love include The Ramones*, The Who*, Bjork, Guns N Roses, Iggy Pop, Kiss, Morrissey, Buddy Holly*, Oasis, Rush, The Kinks, The Strokes and Queens of the Stone Age. The asterisk indicate artists who have received the Lifetime Achievement Award by The Recording Academy.